After Star Trek: Enterprise ended in 2005, the franchise went dormant for the first time since Star Trek: The Motion Picture brought it back to life in 1979. However, fans only needed to wait four years for JJ Abrams’ big-screen reboot. 2009’s Star Trek took the “Original Series” characters back to their roots and allowed a new beginning. That flick did well at the box office and resulted in the inevitable sequel: 2013’s Star Trek Into Darkness. The story picks up the characters as they observe the inhabitants of a primitive planet. However, a volcano starts to erupt and will level the place unless Captain James T. Kirk (Chris Pine) and company halt this event. 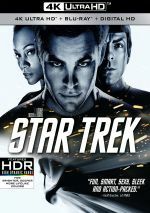 First Officer Spock (Zachary Quinto) handles the main duties and almost dies along the way, but Kirk takes the Enterprise out of hiding in time to save his colleague. This violates Starfleet’s “Prime Directive”, which says that its officers cannot interfere with the normal progress of less advanced societies, and Kirk loses command of the Enterprise. However, before Admiral Pike (Bruce Greenwood) can take over the ship, a Starfleet agent named John Harrison (Benedict Cumberbatch) launches a terrorist attack that leaves Pike dead and Kirk back on the Enterprise. Admiral Marcus (Peter Weller) assigns Kirk and crew to track down and slay Harrison, a task that leads them to the Klingon homeworld. Along the way Kirk learns that this job may not be as simple as it seems, so he and his crew need to deal with a series of complications, some of which connect to Harrison’s true identity. That “true identity” offered possibly the worst-kept secret in modern movie history, so I doubt many out there won’t know Harrison’s real name/background. Still, I prefer to avoid potential spoilers, so I’ll leave out that “revelation”. I really liked the 2009 Trek - probably more than I anticipated. While I’ve always enjoyed the franchise, I feared the worst due to the nature of reboots, as they can seem desperate and misguided much of the time. Of course, some think Abrams’ take on the subject did wind up as “misguided”. Abrams famously indicated that he knew little to nothing about Trek before he got the gig, and some believe that lack of familiarity damaged the film. 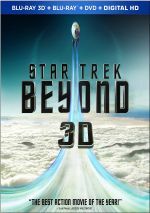 As much as I enjoyed the 2009 flick, I understood that it wasn’t “traditional Trek”. The movie felt more like a Star Wars-style sci-fi action effort with Trek trappings, as it lacked the more introspective feel of the series’ standard offerings. That was mostly fine with me. While some might view the 2009 Trek as “dumbed down”, I liked the shot in the arm it gave to a franchise that’d bordered on running on fumes for years. This led to a different level of expectations for Darkness, and I’m not sure it lives up to them. This doesn’t make Darkness a bad film at all, though, as I find it to offer a lot of enjoyment. However, I don’t think it quite lives up to its immediate predecessor, and it comes with a few more deficits than I’d like. My main complaint comes from the semi-derivative nature of Darkness. As I mentioned earlier, a reveal of Harrison’s real identity would fall into the spoiler category, and that’s because his character showed up in prior Trek efforts. When I first heard this role would be part of Darkness, I felt disappointed. I really didn’t want the rebooted franchise’s first sequel to come across as a kind of remake. And Darkness doesn’t truly remake the earlier flick, but it leans on it more than I’d like. Perhaps some fans like this “alternate history” side of things, but I don’t. I’d prefer to see the rebooted franchise take advantage of Trek lore but not in such an obvious manner. Leave direct references as inside jokes, not as such prominent inspiration. This leads to a sequence that directly echoes the earlier film – a segment that was deeply emotional in the prior flick. In this case, unfortunately, it falls flat. During the earlier movie, the scene relied on our deep, long-lasting attachment to the characters – and actors – for drama, but we don’t maintain the same connection here. That leaves the sequence as little more than a self-conscious callback without one-tenth the emotional power of its predecessor. These complaints aside, Darkness provides a pretty enjoyable effort. Like the 2009 film, it works best when it highlights adventure. Yes, that stands in opposition to original Trek, which reached its heights due to character/philosophical elements, but I’m fine with that. No, I don’t feel the same commitment to rebooted Kirk, Spock, etc., but I can still have fun with them, and the Abrams Trek brings out the often underdeveloped “exciting Trek” in a positive way. The actors continue to do well with their roles, and they feel more natural this time, as they make the parts more their own. I don’t think any of the actors simply impersonated their predecessors, but I felt the past more actively in 2009. I still see shades of the original actors but think the reboot performers make the characters their own in a more concise fashion. That probably seems most obvious with Pine. In the 2009 film, he didn’t impersonate William Shatner, but he made sure he included some “Shatnerisms”. That was a good idea for the first flick – he had to ensure that fans still saw his Kirk as “real Kirk” – but I’m glad he tones down the mannerisms this time. This allows him to create a character with connections to the past but not stuck there. Quinto’s Spock remains a more complicated venture for me. I found him to be a weak link in the 2009 film and have yet to think of a reason to change that opinion, as he just feels… wrong for the role. There’s a reason he came to prominence as a villain in Heroes and he simply lacks the dispassionate side we expect from Spock. While I don’t want him to imitate Leonard Nimoy, I think Quinto comes across as too peevish to fit the character. He’s not bad in the role but I still have yet to warm to his interpretation. Overall, though, I do like Darkness, and I must give the film credit for its basic popcorn appeal. I don’t think it equals the pleasures of the 2009 Trek and I actively dislike some of its choices, but Darkness presents enough fun to become a good continuation of the series. Star Trek Into Darkness appears in an aspect ratio of approximately 2.40:1 on this 4K UHD Disc - usually. The filmmakers shot about 30 minutes of the movie with IMAX cameras, and that used a ratio around 1.43:1. For those scenes, the 4K expanded to 1.78:1 - it’s not the full IMAX image, but it’s closer than 2.40:1. At all times, sharpness delivered strong images. Virtually no signs of softness arose here, as the movie remained crisp and tight even in the widest shots. Jagged edges and moiré effects didn’t occur, and the movie lacked edge haloes or other distractions like print flaws; it was always clean. Expect a heavily teal palette here. A few earthier tones occasionally occurred – like some prominent reds – but the chilly blues dominated. However one feels about those choices, the disc reproduced them in a positive fashion. Blacks were tight and rich, and low-light shots offered smooth, well-defined elements. Everything here soared and gave us a fine transfer. Note that the IMAX material looked stronger than the 2.40:1 footage. The IMAX shots boasted stunning clarity and vivacity that clearly exceeded the 2.40:1 material. That contrast became noticeable enough to make the 2.40:1 shots less pleasing than I’d like. While they still looked very good on their own, they couldn’t live up to the heights of the IMAX shots. We get ample pleasures from the thrilling Dolby Atmos soundtrack of Darkness. Downconverted to Dolby TrueHD 7.1, the mix made vivid use of all available speakers to create an involving, immersive experience. With lots of battles and space components, the information popped up in logical places, meshed together smoothly and created a wonderful sense of the situations. The soundscape was consistently an active presence and really brought us into the story. Two separate Blu-ray releases of Into Darkness occurred: the original 2013 version and a 2014 “Star Trek Compendium” reissue. The two differed due to the addition of many new supplements as well as the IMAX version of the film – the 2013 Blu-ray kept the entire film at 2.40:1. For comparisons, I opted to view the 4K UHD vs. the 2014 “Compendium” release because both used the same alternate ratio presentation. In terms of audio, the Atmos added a little kick, and visuals also worked better for the 4K – though some “drawbacks” came with the upgrade. This occurred because the higher resolution of 4K meant the differences between the IMAX shots and the 2.40:1 material looked more noticeable. Still, the 4K looked great, so don’t view these variations as a problem – the 4K still demonstrated very good to great delineation. Colors also got a boost – mainly during the occasional moments where the movie veered away from teal. As good as the Blu-ray looked, the 4K topped it. One other comparison should occur: between the 4K and the 3D version. As much as I enjoy 3D, I preferred the 4K in this case. The 3D imaging for Into Darkness added a little spark but didn’t dazzle me – and it also provided just the 2.40:1-only film. The increased resolution and the IMAX shots made the 4K the best available Into Darkness. Virtually no extras appear on the 4K, but we do get plenty of materials on the Blu-ray copy, a two-disc affair that replicates the “Compendium” edition. On Blu-ray One, we get an enhanced commentary. This combines picture-in-picture capabilities with a varying roster of participants. These split into nine chapters with a total running time of two hours, 42 minutes and 46 seconds. As for the commentaries themselves, they tend to be up and down. The best chats come from the editors and from Abrams, while some of the others tend to be a little dry and technical. In addition, Burk and Lindelof joke too much, and a fair amount of dead air occurs at times; this becomes a particular problem after the Mindel/McCleery chat as well as before/after some of Giacchino’s moments. On Blu-ray Two, we locate a series of 21 featurettes. Via a “Play All” option, these run a total of two hours, two minutes, 14 seconds. We find The Mission Begins… Again (2:28), Creating the Red Planet (8:28), Introducing the Villain (2:16), Rebuilding the Enterprise (5:31), National Ignition Facility Home of the Core (4:32), “Attack on Starfleet” (5:25), Aliens Encountered (6:54), “The Klingon Home World” (7:30), “The Enemy of My Enemy” (7:03), Vengeance Is Coming (4:28), “Ship to Ship” (6:03), Mr. Spock and Mr. Spock (4:08), Down With the Ship (6:09), Kirk and Spock (5:36), “Brawl By the Bay” (5:44), Fitting the Future (5:03), Property of Starfleet (4:53), Unlocking the Cut (5:10), Visual Affection (9:03), The Sound of Music (And FX) (5:26), Safety First (2:27) and “Continuing the Mission” (1:57). These cover sequel-related challenges, story/character areas, sets and locations, creature, costume and art design, various effects, camerawork, cast and performances, stunts and action, makeup, editing, music and audio, and some other topics. When I reviewed the original Blu-ray, I indicated that I liked the collection of featurettes but thought they seemed a little on the skimpy side. I can’t make that complaint now, as the nearly two hours of material covers a broad array of subjects. These offer a strong examination of the movie’s creation. To call the added footage insubstantial would be an understatement, as nothing here offers anything important. That said, the clips give us entertainment value, especially when we get to see the fabricated captain’s log Spock mentions in the theatrical cut. We also find out what became of the little girl near death early in the film. These bits become fun to see but they don’t expand the story in a notable manner. While not as good as its immediate predecessor, Star Trek Into Darkness provides an enjoyable adventure. It comes with a few questionable choices but packs enough action and fun to make it a winner. The 4K boasts superb picture and audio along with a strong roster of bonus materials. This 4K doesn’t blow away the “Compendium” release of Into Darkness, but it does become a pretty decent upgrade.